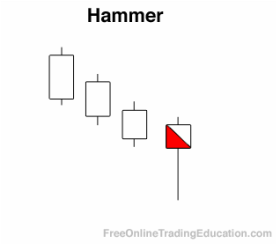 A Hammer candlestick is formed when the price moves lower after the open, and then comes back to close above the intraday low and near the open. This candlestick typically has a small real body (regardless of color) with a lower shadow that is at least two times the measure of the real body. A classic Hammer has little to no upper shadow. Conversely, if this candlestick is formed after an up leg, it is considered a Hanging Man candlestick. Technical analysts often use Hammers as the beginning of buy signals especially when in context of another tradable buy pattern.